But these ex-votos were never exhibited or published. What Steinberg did share publicly are many of the works already discussed, which are best understood as evolutions from earlier conceits—as are others that follow below. One can see in some of these drawings, especially as the 1980s progressed, that his aging hand grew looser as he applied pen—or pencil or crayon or marker or pastel or watercolor—to the page. 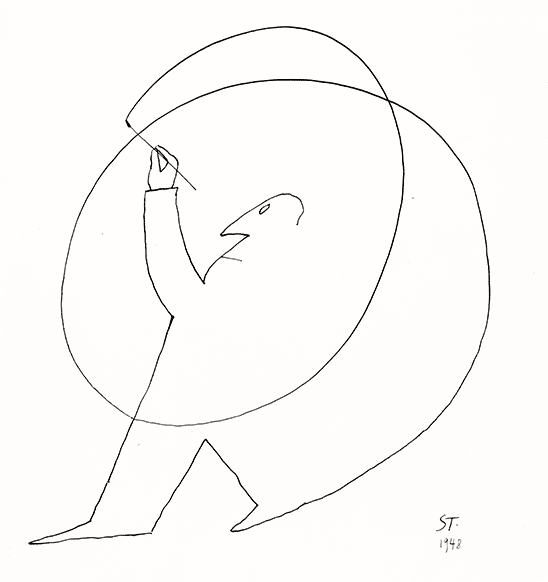 The main event of the 1980s for Steinberg was his departure from The New Yorker. In 1985, the magazine was sold, and the new owner fired William Shawn, his friend and long-time editor; Steinberg (along with other contributors) withdrew in protest. It would be five years before he resumed his contributions—first with cover designs submitted before 1985, then with drawings for covers or portfolios taken or developed from his files.69 In the 1990s, bouts of depression and a thyroid cancer scare stymied his creative energies. Sigrid Spaeth committed suicide in 1996; in early May 1999, he was diagnosed with advanced pancreatic cancer, from which he died on May 12.